So impress. Wow such tempt. Much memes. 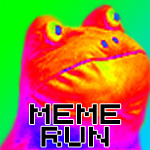 Following on from their Wii U eShop debut with mediocre brain bamboozler IQ Test, Ninja Pig Studios has revealed some early details of Meme Run, which will be their next game developed in Unity and promises to be one of the more subversive games in the short time that Nintendo has welcomed indies using Web Framework and Unity onto its platform. After posting about this upcoming game on Miiverse, there has been quite a bit of chatter from other indie developers on Twitter about the validity of this game and questions about the nature of the 'race to the bottom'. As with RCMADIAX's recent release of SPIKEY WALLS, some feel this is a step too far into the abyss. Rather than simply dismiss what could turn out to be a masterpiece of video game design, we reached out to Jordan Schuetz from Ninja Pig Studios to understand his rationale behind the upcoming game. 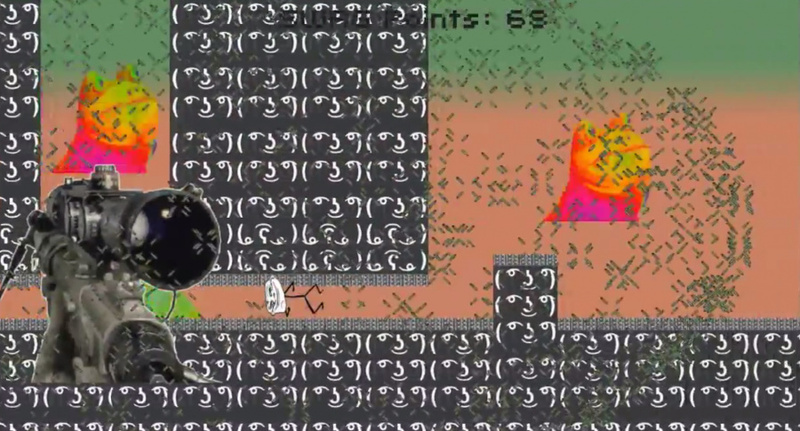 "This was a game created by me Jordan (20) and my 14 year old brother Garrett. We love the Montage Parody subreddit, and wanted to create a parody game based off that subreddit. In our free time, we made the game. We ended up sharing the game on Facebook amongst our friends for free. Everyone we knew loved the game and thought it was so funny. We then asked some people on Miiverse what they thought of the game. The reaction from the younger audience was amazing, thus we want to bring the game to the Wii U. Me and my brother wanted to make the game very difficult to beat, and the trailer doesn't even showcase all of the crazy events that happen during the song so you will just have to play it for yourselves to find out how crazy the game gets." The ever-defiant Schuetz assured us that the game is a work in progress and is subject to change; "People seem to be taking this game very seriously, but keep in mind, it's supposed to be a troll game; the main character is a troll face!". What do you think of the concept behind this game? Is it a step too far for the Wii U eShop and Nintendo should clamp down on it, or is this all valid self-expression? As always, let us know your thoughts by posting a comment below. Over 1 billion Nintendo Wii U consoles sold in one day?! I feel like poking my eyes out. This must be a joke. There are lots of developers trying to make good games that doesn't even get the sales they deserve, and giving visibility to these "troll games" is unfair. I really hope Nintendo doesn't accept this, or their seal of quality will mean nothing. Well then. I have just found the bottom of the barrel. I literally have nothing good to say about it. It looks awful. It sounds awful and it's a bland endless runner. Nope. ...If some 14 year old kid can co devolope THIS for Nintendo, I want a dev kit now! Nintendo may benefit in the short run by approving such trash, but it will hurt them big time in the long run. And they should just put this game on apple products, it would make them a lot more money than it will on Wii U. I highly doubt very many people will buy a Wii U for this, and it will just make Nintendo look even worse to Nintendo haters. Sadly I think it will go through with all of the other things being approved lately. If this can make it onto the eShop, then all this talk from 3rd-parties and indie developers saying that it's hard to get games onto the eShop is total bullocks. My god. It's the beginning of the end. @iPruch The Seal of Quality never ment anything, it was just a fancy way of saying "this game is legaly released on our console". @97alexk Sorry, your guarantee means absolutely nothing. As long as it isn't overly violent or contains direct sexual activity, Nintendo won't stop anyone with a devkit from releasing their game. The real question is, how will the game pad be utilised? It should come with a meme creator. If it costs no more than £3, I'll get it "for da bantz"
This is the kind of crap you used to see for free on flash game websites. Does Sakurai have time to add this as a smash bros for wii u stage? Maybe dlc? Jk, but honestly i don't know how to feel about this. As kaze_memaryu noted, this COULD be a subversive gem if they try hard enough. Or it could just be a really bad game. Which brings up another question...just because a game is atrocious, even admittedly so, does that mean it shouldn't have the right to exist on the platform? Maybe I'm just one of those "freedom of expression" guys (I have my limits of course...just look at my username), but are people really going to say, "yeah I know they say mario kart 8 and smash bros are amazing, but I can't support the system because right alongside them is the letter"? It's actually a pretty smart idea for a simple game like this. One I had myself as a general thought but never actually bothered to turn into a real game. Kudos to these guys for doing just that however because they're likely to make quite a few bucks for turning an idea like this into an actual commercial product. This looks and plays like Bit.Trip Runner! Edit: Above comment, nice XD. "This is something I expect on an app store, not the eShop. Not trying to be harsh, but it's true." I'd prefer playing Runner 2, way more fun than this. Brace yourselfes....shovelware is comming ! I value that at $0.50. I'll only buy it if that's what they charge. ...and I second what @PvtOttobot said. This is insanity. I would have never imagined something like this coming to Wii U. THESE GAMEZ NEDZ SANIC HEGEHOG PLLLLLLLLLLLZ DEV, IF U C THESE!!!!!!!!!! It has potential, but I can't stand all that's going on in that trailer. It hurts my eyes. Also Dolan Duck and Shrek or no buy. @PvtOttobot Yeah, where's my dev kit? I have always wanted to make a game and now the bar is so low. This is Soda Drinker Pro level bad. Worse, they won't be doing it for free. The gameplay videos they put out are full of copyrighted music and images. I hope they release this game and get taken to court over it. Oh what the hell is this? I couldn't make it through the trailer. Not buying it confirmed! @accc That might be the hook for Nintendo to reject this. It is not my cup of tea. I am not sure if it is anyone's cup of tea, or coffee, or Surge. I got all the laughs I needed from watching this video. It'e not worth any amount of money anymore. Oh god. I MUST HAVE THIS GAME. Isn't the troll face copyrighted? I'll bet you anything the developer never got the rights to use it. I logged onto my account for the first time in over a year just to comprehend the cancer of this product. I don't even know how to express my utter disapproval of this creation. Would not get if free. Oh my god, kill it with fire!!!! Am i the only one looking forward to buy this? I'll say, this game could be a success, but... not really. I mean, provided they can pull a Smash Bros. by giving most, if not all, memes some coverage, but doing so needs some permission as a few memes do have copyright holders (such as the one who's a meme by not being a meme, that is, Simpsons sidekick Milhouse Van Houten, and given how strict Fox is when it comes to trademarks...), which will inevitably get in the games' way. That said, I completely agree with @iPruch. He nailed the point. @Blue_Dread I don't always buy eShop games, but when I do, they are swaggy games like dis. Remember my friends: the best way to improve eshop quality is the power of our wallet. DON'T BUY TRASH, NO MATTER HOW CHEAP IT IS. @CaptMcCloudAran Very true, now if I could just return Pokemon Rumble U back to Nintendo.... I only say that half-kidding. What the hell did I just watch!!! Well you guys wanted the eshop to be full open for every john and jane to make games, and here it is. I wonder how many copyrights and stuff will this game violate. 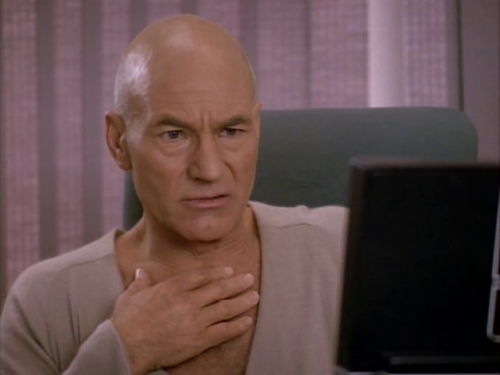 are those loud screams from the Wombo Combo video? it's actually kind of funny, but I think that the repetition of only a few memes will get old. It needs to stay fresh with loads of different memes all the time in order to not get old. OF COURSE. you just had to ask miiverse. you just HAD to ask miiverse about this game. In all seriousness, it's meme-ness nature with it's simple concept tend to work. Send in enough meme and make the controls work for it to not be as repetitive (at least not much) and we got ourselves a decent product. All right, this is so horrifically terrible that I actually created an account just to say... THIS IS GARBAGE! The only people who would buy this are those immature idiots who do NOTHING ALL DAY but hang on Miiverse's Smash Community and do NOTHING even then aside from post annoying and stupid meme crap. If this gets greenlighted, I'm emailing Nintendo to ask them why. I'm serious, I'll do it. And while I'm at it, I'm gonna email the people who made this and try to get them to stop trying to get this onto the Wii U. This is not acceptable for a Wii U game. I don't care how little it costs. Laughing at the people who think that the Nintendo Seal of Quality ever meant a game was good. It just meant Nintendo allowed it to be officially released. You're not alone. Feelin' better already? @Kaze_Memaryu Thats not how it works, thats not how any of this works! I just emailed ninjapig studios in an attempt to prevent this from making it to the Wii U. I told him that while it is a good concept and it really isn't that bad of a game in general, it simply doesn't belong on Wii U. I told him he should re-direct his efforts to app stores where he will get a better response. Come on it's 2014 is memes still a thing? And to those of you who discredit the "Nintendo Seal of Quality." 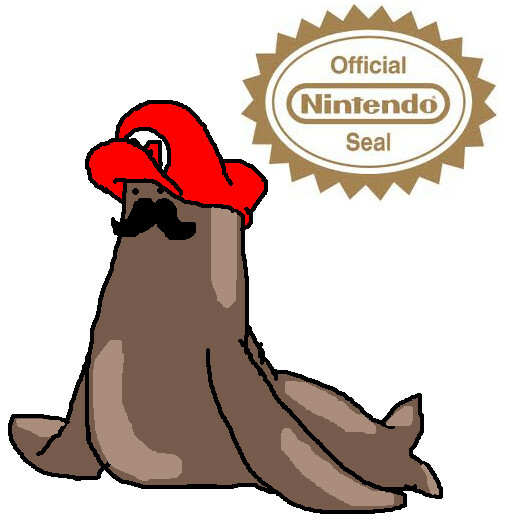 Nintendo used the Seal of Quality to assure gamers that game was indeed of good quality and had potential to be a really good game. They did this in order to bring the video game industry out of the crash that was created by Atari, after which NOBODY wanted to buy video games anymore due to horrible quality. Go do something that is anatomically impossible. Maybe Nintendo should raise their standards so a college-aged kid cant put a free flash game he made with his little brother on the eshop? Anyways, I thought people were done with memes. It's not 2011, people who read rage comics and enjoy /r/adviceanimals are the lowest echelon of humanity. Ech. Looks like something you'd see if you were on some serious drugs. @Tuosev No need to get so rude when defending your opinion. By your logic, every game ever released on the NES is good. The Seal of Quality did indeed have meaning, but revisionist history has turned it into something it wasn't. @XCWarrior You mean ET for the Atari. The NES didn't even exist when that game or movie came out. @SockoMario you do realize the Nintendo seal of quality had nothing to do with how "good" a game was, right? Hopefully, these indie devs will stop releasing rushed games, or games that should have been free Flash games in this case, on the eShop soon. After all of the problems the Wii had with shovelware, these types of games really aren't helping. The Nintendo 'Seal of Quality' was NOT to avoid garbage games. There was plenty of trash on the NES / SNES and N64. The seal was simply to try and prevent unauthorized games on their system. They made the cartridges, they controlled revenues. It wasn't really even a piracy issue. They just didn't want anyone to subvert the licensing cost paid on every cartridge. It's a system that was put in place on the NES and continues to this day. Comparing digital, 1$ titles to the 60-80$ games of the NES / SNES is, frankly, idiocy. This game doesn't look any worse than I've Got to Run, and the endless runners have an audience that likes them. Not every one of them has to feature Charles Martinet, take hours to finish, have DLC and super catchy, premium music. That's why Runner 2 was 15$ and this is 1$. Honestly, if a gamer wants to spend 300$ on a new console, let them play whatever mind numbing garbage they want. I'm not even judging the game, I just hate meme culture. Well, I'd certainly prefer this to Spikey Walls. Here's the beautiful hypocrisy: people moaned and whined about Retro City Rampage's extended development and delays. The developer whined about a sales quota. The Wii Shop bankrupted smaller studios because the casual fans never bought any decent games. Nintendo listened, removed the sales bar and introduced Unity support, a platform to allow gamers to make games without worrying about the 10-15 thousand dollar dev kit. The Wii U hits a drought. retail titles slow. 3rd party support dries up. Gamers expect better games, not understanding that the stupidly low install base is what's holding budgets down, not desire. Why go Wii U exclusive? There's nowhere near enough people to make it worthwhile. Why put the game on Wii U if a Steam / PS4 / PS3 version exists? The answer is coming to us from 3rd party devs. The more expensive the games, the more money the dev is going to be wasting. Existing Wii U owners sound like braying goats. I swear, everytime I come to this site, there's 40-60 people on their soapbox, railing on the next terrible 'shovelware' title, like it's a pop-up ad, ready to jump out at them or force them to buy it. Why are 3DS games listed on the Wii U's eShop? That is a far more obnoxious act, and it wasn't by some middling 3rd party. Nintendo did that. Wading through droves of 3DS titles to find Wii U games can get incredibly annoying. But yeah. Having a game you're not going to buy on the eShop is SUCH a pain. Wonderful 101, NFS: MWU, MH3 U, Lego Hobbit, Just Dance, Wii Party U, ZombiU, ACIV, tons of NES 'classics' and plethora of other games are on the eShop, but I'm not complaining. I just don't buy them. They wanted to troll Indie gaming and they clearly succeeded judging by how everyone is acting over this. I actually think that as stupid as this looks, its pretty genius. I understand why people are getting upset over why games like these and Flappy Bird clones are getting greenlit onto the eShop but this is the unfortunate reality of the industry, though honestly this looks worth trying out. I love memes and think that this is hilarious like you gotta admit they're doing it out of having spirit for the Internet. Oh I couldn't bear watching this! So this is just an endless runner with obstacles that make no sense and attempt to give you a headache with their absolutely horrible graphical effects? Okay, whatever. Wii U eshop = Steam 2.0. I'm fine with meme culture and I'm familiar with most of these memes, but it just looks like it'll play badly and become frustratingly repetitive. And I can't bring myself to play through bad games anymore. @WalupeachyTime The whole point much? Remember, this is a tech demo (pretty much). So calm down, there will be more annoying poopoodoodoocacapoopledoople that makes the game better somehow. @T900Kassem The point was to make something that sounds and looks awful? I apologise for the argument, but saying that it's supposed to be terrible doesn't excuse it's quality. I understand why people think it's funny, but I personally don't see the humour with it. It just seems obnoxious from what I've seen. No, just no. Please don't allow this Nintendo! This is obviously bottom of the barrel crap. I hope the receive the welcome they deserve for slathering this crap sandwich with even more crap. My biggest fear is that Nintendo will tire of this sort of idiocy and the accompanying feedback and instead of addressing the issue case by case, will go back to their old ways… making indy development a nightmare. My friend and I have only just begun to explore Construct 2. I hope we get the chance (however slim) to attempt to bring a (quality) game to the Wii U before the gates close for good. ok what the actual love? Looks like they are trolling us! It looks awful, and all the screaming hurts my ears! Trolololo! Did the video get removed?